New Delhi, Nov 18: With a ministerial committee set up to resolve the four pay commission issues delaying a decision, the Armed Forces have strongly conveyed to the government that there should be "no dilution" on their demands concerning their officers and jawans. 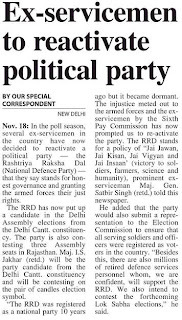 "We have re-conveyed to the government that there should be no dilution as far as the four core issues are concerned relating to the Sixth Pay Commission notification issued in August this year," Armed Forces officers told reporters today. The assertion comes in the wake of reports that the government was trying to find a "middle path" to break the deadlock over the armed forces' demands that included placing Army Lieutenant Colonels and their equivalents in the Navy and Air Force in Pay Band-4. The government had a fortnight ago sent a top-ranking officers to the Armed Forces headquarters for talks to assess if the three Services would accept a "compromise formula" to resolve the four issues when this strong sentiment was conveyed to the government. The other three demands from the Armed Forces included parity of Grade Pay to officers from Captains to Brigadiers with that of their civilian counterparts, placing Lieutenant Generals and their equivalents in Higher Administrative Grade Plus pay band and restoring the 70 percent pensionary weightage for jawans. It is learned that the government was considering a "middle path" under which it would accept the Armed Forces' demand relating to Lieutenant Colonels. But, instead of placing them in Pay Band-4 scales after 13 years of service when they actually picked up the Lieutenant Colonel rank, these officers would be placed in the Pay Band two years after getting the rank (after 15 years of service). That would translate into Lieutenant Colonels remaining in Pay Band-3, as recommended by the Sixth Pay Commission, for two years after picking up the rank and achieving parity with their civilian counterparts later in their service (after 15 years) when they would be placed in Pay Band-4. "This is not acceptable to the armed forces. The Ajai Vikram Singh Committee Phase-I on cadre restructuring implemented in 2004 has already fixed that Majors pick up their Lt Col rank after 13 years of service. Now, by introducing this clause in the Pay Commission, the bureaucrats were actually trying to dilute what AVS Committee had already granted," officers said. They also lamented that in the month-and-a-half since the government set up the ministerial committee under External Affairs Minister Pranab Mukherjee to consider their grievances, the delay was leading to counter demands from the paramilitary forces. Also, the delay led to some sections of the bureaucracy introducing seven new anomalies in the pay commission through the services instructions issued by the Defence Ministry on the pay commission notification, they said. They pointed out that the Defence Ministry bureaucrats had arbitrarily introduced amendments in Draft Government Letter on the pay commission and issued the special instructions governing the armed forces' pay on October 20 under which the 'military service pay' and 'rank pay' were re-defined, subverting the purpose for which it was recommended in the first place. "The changes in the definition and meaning of key pay commission recommendations have been done on the sly to deal a blow to the armed forces' morale and to deny them their due," the Services headquarters informed the government. Officers said the subversion of the definition of rank pay would mean the armed forces officers would take home less pay than what was intended to by the hikes provided in the pay commission notification. The Services have pointed out that since the 4th pay commission, the rank pay was calculated as part of the basic pay of the armed forces personnel. "This government policy provided the personnel a higher house rent, travel and dearness allowances. However, by re-defining the rank pay and de-linking it from the basic pay, the bureaucrats have ensured that the armed forces personnel take home less amount as allowances," sources claimed. The military service pay (MSP), introduced by the 6th pay commission for the first time, was meant to be a "compensation for difficulties specific to military life". However, the Defence Ministry instructions, referred to it as a "hardship allowance" to security forces in forward areas. 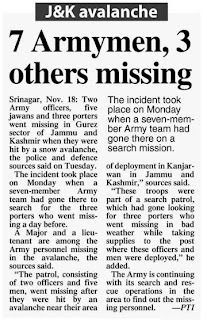 The Services have questioned the rationale behind this re-defining of the MSP, wondering if it was meant to be provided to other security forces too working in counter-insurgency areas. One other issue brought out was fixing basic pay for Colonels and Brigadiers at scales lower than what was awarded by the 6th pay commission. The basic pay fixation for Colonels and Brigadiers was to be done under S-25 pay scales. Under the new Defence Ministry instructions, the two sets of officers would be provided only S-24 pay scales. Standing its ground on the four core demands pertaining to parity and status that stands lowered after the Sixth Pay Commission report, the armed forces have now conveyed to the government that there can be no dilution of these demands. These demands are being looked into by a three-member ministerial committee headed by foreign minister Pranab Mukherjee and has defence minister A.K. Antony and finance minister P. Chidambaram as members. In the past few days, a senior government functionary had spoken to the top brass of the forces to find out a “middle ground” where the matter could be resolved. The same has not been agreed upon in the discussion as the forces have highlighted once again that the status has been lowered vis-à-vis civilian and paramilitary officials. One of the suggestions made during discussions was that Lt Cols be placed in the pay band 4, only after completing 15-16 years of service. The Sixth Pay Commission had placed Lt Cols in the pay band 3. 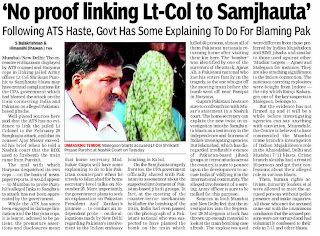 The same was protested by the forces as they wanted Lt Cols in the pay band 4, on a par with civilian and paramilitary officers. This is one of the four core issues being studied by the group of ministers. The government had suggested that an officer becomes Lt Col after 13 years of service. However, to place him in the pay band 4 instead of the existing pay band 3, let the number of years of service for the eligibility be increased to 15-16 years. This was not to affect his promotion as Lt Col that would be due after 13 years of service. Only the next pay band be given after more number of years, the government had suggested. Another suggestion was for creating a separate pay band for Lt Cols. The forces had pointed out that all officials in the civil and paramilitary had assured promotion. The other three core demands of the forces are higher administrative grade for all Lt Gens. The sorting out of the grade pay that has been lowered and the restoration of 70 per cent of the pension benefits for jawans. The three service chiefs had protested and the Prime Minister had formed a high-level committee. The issue of Lt Cols has led to the most number of debates in the government circles. The central police organisations (CPOs) and paramilitary forces (CPMFs) have demanded that their “second-in-command” rank officers be also placed in the pay band 4 if Lt Cols and their equivalents are included in this pay bracket. The CPOs and the CPMFs decided to make such a demand at a joint meeting of their DGs held a few weeks ago, sources added. There is some good news on the pay front for personnel below officer rank (PBOR). While armed forces officers and civilians retiring before September 2008 will not be granted full pension unless they have completed 33 years of service, the PBOR will be eligible for this benefit. Pension orders issued by the ministry of defence last week state that the PBOR retiring after January 1, 2006, will be granted full pension on the completion of 15 years of service, but the same will be applicable to commissioned officers only after September 2, 2008, and not January 2006. The Sixth Pay Commission had recommended the scrapping of the requirement of 33 years’ service for earning full pension. Prior to this, pension was proportionately decreased according to the length of service. Officers and the PBOR would be eligible for full pension after 20 and 15 years service, respectively. However, pension orders issued by the Department of Pension and Pensioners Welfare on September 1, 2008, the guidelines of which are also applicable to the defence ministry, state that the scrapping of the 33 years’ clause will be applicable to those retiring from September 2008. The recommendations of the SPC are being implemented with effect from January 2006. Commissioned Officers and civilian employees in other departments retiring between January 1, 2006, and September 1, 2008, will remain amenable to the 33-year service clause for earning full pension. This will affect the fixation of pension for life. Consequent to the Department of Pension’s directives, sources said there would now be three categories of pensioners in the armed forces -- the PBOR retiring after January 1, 2006, who would receive full pension after completing the minimum pension qualifying service of 15 years, commissioned officers retiring between January 2006 and September 2008, who would receive full pension only if they had completed 33 years of service (with or without weightage), and finally commissioned officers retiring after September 1, 2008, who would receive full pension after completing 20 years of service. Lt Col Shrikant Prasad Purohit, who has been accused of carrying out the bomb blasts in Malegaon on September 29 this year, faces charges of assaulting a Christian priest three years ago in Pune. 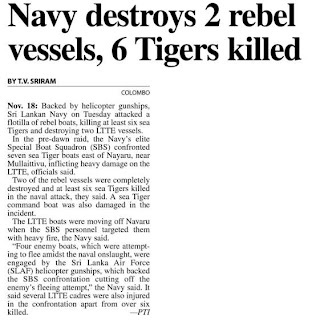 COLOMBO: The Sri Lanka Navy (SLN) on Tuesday claimed its elite Special Boat Squadron (SBS) destroyed two LTTE boats and killed six of its cadres in a predawn battle off Nayaru. A statement said detecting a cluster of seven LTTE craft off Nayaru, the SBS opened fire and destroyed two craft and damaged another. Air Force helicopters provided air support as the Navy attacked four LTTE boats. 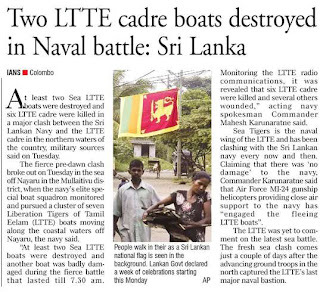 The Navy, citing intercepted LTTE communication, said six cadre were killed and as many injured during the battle, which lasted 90 minutes. Separately, the Defence Ministry said the 59th Division, operating in Mullathivu, launched multi-pronged offensives in the area on Tuesday. “The LTTE suffered severe damages during the confrontations in Andankulam general area. Intercepting LTTE radio communication, it is confirmed that many LTTE cadre were killed. In subsequent search operations conducted in the area, troops found military items left behind by the fleeing terrorists,” said the Ministry. 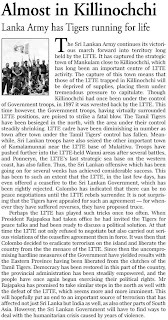 Pro-LTTE TamilNet claimed that in the Jaffna Peninsula, the LTTE put up stiff resistance as the Army attempted to breach Forward Defence Line. “Heavy clashes erupted along the FDL on each attempt, said the Tigers. 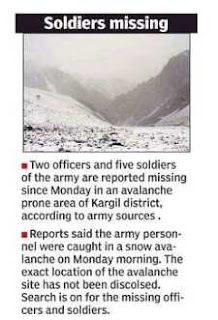 At least 36 soldiers were killed and 90 wounded, said the Tigers,” it claimed. The website said the Army launched artillery and multi-barrel rocket launcher fire towards Vadamaraadchi, Iyakkachchi, Paranthan, Kugnchup-Paranthan, Kumarapuram and the suburbs of Kilinochchi on Tuesday. India will formally hand over 1,680 metric tonnes of relief materials to the International Committee of Red Cross (ICRC) on Thursday for distribution to the civilians affected by the conflict in the north. A ship carrying the consignment destined for displaced persons in LTTE-held areas arrived here three days ago. Dinker Asthana, spokesperson for the Indian High Commission here, said: “It is a large consignment. We expect to clear customs formalities and hand over the material to ICRC on Thursday.” The supplies include food, clothes, hygiene and sanitary materials. Both civilians and the military brass might find it seductive to merely seek “control”: But India needs a policy framework that redefines the roles and responsibilities of the top echelons of India’s defence set-up. It needs a restructuring of the Armed Forces. 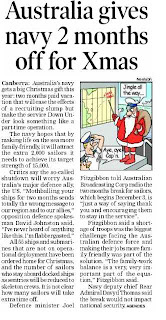 Unless this happens, India’s approach to emerging security threats will remain reactive, ad hoc and suboptimal. 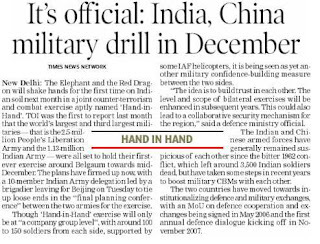 NEW DELHI: The Elephant and the Red Dragon will shake hands for the first time on Indian soil next month in a joint counter-terrorism and combat exercise aptly named 'Hand-in-Hand'. 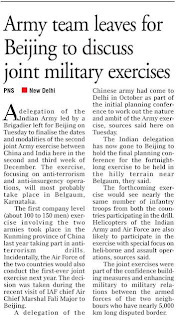 TOI was the first to report last month that the world's largest and third largest militaries — that is the 2.5-million People's Liberation Army and the 1.13-million Indian Army — were all set to hold their first-ever exercise around Belgaum towards mid-December. The plans have firmed up now, with a 10-member Indian Army delegation led by a brigadier leaving for Beijing on Tuesday to tie up loose ends in the "final planning conference’’ between the two armies for the exercise. 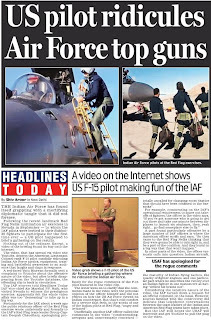 Though 'Hand-in-Hand' exercise will only be at "a company group level", with around 100 to 150 soldiers from each side, supported by some IAF helicopters, it is being seen as yet another military confidence-building measure between the two sides. "The idea is to build trust in each other. The level and scope of bilateral exercises will be enhanced in subsequent years. 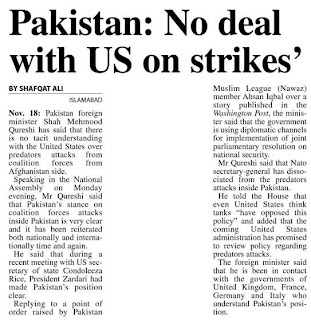 This could also lead to a collaborative security mechanism for the region," said a defence ministry official. 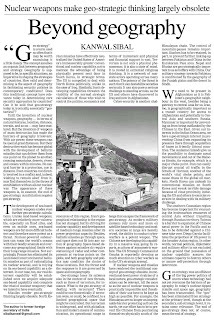 The Indian and Chinese armed forces have generally remained suspicious of each other since the bitter 1962 conflict, which left around 3,500 Indian soldiers dead, but have taken some steps in recent years to boost military CBMs with each other. The two countries have moved towards institutionalizing defence and military exchanges, with an MoU on defence cooperation and exchanges being signed in May 2006 and the first annual defence dialogue kicking off in November 2007. Russia's resurgence as a strategic actor and a new cold war player is widely discussed in the United Kingdom and Asia. Russia Prime Minister Vladimir Putin during his presidency made unbelievable economic and military progress. In UK intellectual circle, the resurgence of Russia in the international arena is considered a big issue of the near future. Russia's new policy direction - and particularly its nascent interest in alternative energy - is important because Russia is such a large energy exporter. The re-emergence of Russia on international arena and more importantly Putin's intellectual approach to developing a foreign policy, has presented an issue for the world to think about. Russia under the leadership of President Putin outlined a new policy for central Asian region. President Medvedev has recently enunciated five principles of Russian foreign policy. A number of contradictions are built into them. Medvedev, unlike Putin, is more willing to try to implement changes in world policy. He believes there is a lot to change. During his Presidency, Vladimir Putin took several actions indicating that the country plans to reclaim its position as a military power on a global scale. Russian bombers were back on long range patrols, and a submarine crew recently planted a Russian flag on the seabed beneath the North Pole. During the Putin years, Russian economy saw the nominal Gross Domestic Product (GDP) increase 6 fold, climbing from 22nd to 11th largest in the world. In 2007, Russia's GDP exceeded that of 1990. The trip of President Medvedev to the G20 summit is expected to deliver any breakthroughs on troubled U.S.-Russian relations, as little movement is likely before current U.S. President George W. Bush leaves office in January. On the war in Georgia, US and European leaders immediately condemned Moscow for flouting established borders. The challenge facing the next US president will be to manage Russia's emerging role as a powerful and alluring alternative to the West. 'Russian leaders are trying to wield the language of stability, humanitarianism, and prosperity. If the rift between Russia and the West widens, it will not produce a repeat of the Cold War. Instead, it will create a new and delicate rivalry over the ability of each political system to explain its own inconsistencies to its citizens and the wider world. Military sources say, Russia has around 5700 active nuclear warheads. Poland will contain just 10 interceptor missiles. The most likely strategic purpose of the missile defense programme is to mop up any Russian or Chinese missiles which had not been destroyed during a pre-emptive US attack. The politics of Missile defense has recently become one of the most acute problems of international politics. Plans by the United States to deploy a third position area in Eastern Europe for its national missile defense system triggered a sharp reaction from Russia, which threatened to take countermeasures. Russia's strategic forces have conducted regular test launches of Soviet-built ballistic missiles to check their performance. The military has repeatedly extended the lifetime of Soviet-built weapons as the government lacks the funds to replace them quickly with new weapons. The basic factor of mutual distrust between Russia and US increased readiness of their strategic nuclear potentials in line with the task of mutual nuclear deterrence. The U.S. is trying to convince Russia that the new missile defense system will not be directed against it. But Russia considers it as a military threat to its national defense. However, statements like this run counter to Washington's doctrinal approaches to its defense policy. Russia has repeatedly made it clear that Russia's territory allows for the building of a missile defense system with a structure that can best ward off missile threats from the south. A missile defense system can be effective only if it is capable of hitting a target at various phases of the trajectory of a missile or warhead. Barack Obama, immediately, after his election as US President said it would be prudent to "explore the possibility of deploying missile defense systems in Europe," in light of what he called active efforts by Iran to develop ballistic missiles as well as nuclear weapons. Russia remains one of the world's leading military powers. It is second only to the United States in nuclear weapons, and Russia remains the strongest power in Europe and Asia in terms of its conventional ground, air, and naval forces. For more than a decade, Russian leaders have struggled to formulate security and defense policies that protect Russia's borders and project Russia's influence. After attaining broad macro economic stability and high growth likely to exceed both India and China in 2008 as per the IMF, the focus is now on using the oil windfall to build and modernize infrastructure and create an environment conducive to business, particularly the non commodities exports. There are still many financial crises in Russia but debates are under way on the growing Russian economic power. Today practically all socio-political groups and blocs in Russia are discussing the country's future along with opportunities of economical growth, but are suggesting very different ways of solving existing problems. On the Russian political and military influence, Moscow-based military expert Vladimir Mukhin says Russia has lost much of its position in Central Asia since then. But Russia still has troops and bases in Central Asia in Tajikistan, Kyrgyzstan, and in Kazakhstan. However, analysts in Tajikistan analysts say that merely strengthening its military presence in Central Asia doesn't necessarily mean Russia's influence there will rise. On November 11, Russian President began a working visit to Kazakhstan to discuss the security situation in the region. The CSTO comprises Armenia, Belarus, Kazakhstan, Kyrgyzstan, Russia, Tajikistan and Uzbekistan. Moscow, Nov 18 (PTI) The Russian Navy will keep the accident-hit K-152 Nerpa nuclear attack submarine rather than lease or sell it to India with which negotiations were held about a possible deal worth millions of dollars, a top defence official here said today. "The sum of USD 650-780 million, which Rosoboronexport and the Amur Shipbuilding Plant had negotiated over a long period of time with the Indian Ministry of Defence, will now be found in Russia, either within the state weapons procurement programme or somewhere else," Chief of the General Staff, Army General Nikolai Makarov, told the government daily 'Rossiiskaya Gazeta'. The construction of the Akula II class Nerpa nuclear attack submarine started in 1991, but was suspended for over a decade due to lack of funding. A toxic gas leak aboard the vessel during sea trials recently had left 20 people dead. Under the larger Gorshkov package, the construction of the submarine was partially financed by India at the cost of USD 650 million for a 10-year lease of the 12,000-tonne Akula-II class vessel considered the quietest and deadliest of all Russian nuclear-powered attack submarines. A new pattern of military involvement in politics is emerging in Pakistan and Bangladesh, which could be called "power without accountability", a trend that bodes ill for their infant and fragile democracies. In Bangladesh, the military intervened ostensibly to correct the mess, to use army language, by propping up its cohorts in the form of a caretaker government. Policy directions and actions of the new government are determined essentially by the armed forces. The Pakistani army has spread its tentacles in every department of the government and society and continues to exert its power in crucial matters of the state including sponsoring terror networks in the neighbourhood, no matter whether Pakistan remains a failed state and dangerous even for its own people. The Bangladeshi military is fast imitating the Pakistani model, albeit in a different form, to place itself as an arbiter in each and every aspect of social, political and economic life of the country. Like in Pakistan, the army in Bangladesh does not necessarily have to come directly to power. It can wield effective power even while remaining in the background and constantly destabilise politics and deprive democratic forces the necessary political space. The military-backed caretaker government took over on January 11, 2007 from its troubled constitutional government after unprecedented violence and political consternation. Since then, Bangladeshis have lived under a state of emergency: their constitutional rights have been suspended, civil liberties limited, and hundreds of thousands - ranging from former prime ministers to ad hoc peddlers - have been arrested under the excuse of "fighting corruption". Instead of fulfilling a promise to establish better, truer democracy, the unelected government helped the process of the politicisation of the army blurring the lines between military and civilian administration. Islamism is a rising threat in Bangladesh and the present government has not taken any meaningful measures to combat the scourge. Instead of containing Islamism and paving the way for the blossoming of democracy, the current arrangement has not only reduced the space for the more established and relatively more secular parties but also helped to consolidate and strengthen Islamist movements, particularly the Jama'at and its ancillary organisations, which had always maintained close links with the military establishments. The Bangladeshi jihadi outfit Harkat-ul-Jihad-al-Islami (HuJI ) is suspected to be involved in last month's blasts in Assam. The HuJI is thought to maintain close ties to the Indian Mujahideen (IM), an indigenous terror group that has claimed responsibility for most of the recent bomb blasts across India. In Pakistan, the victory of the two major political parties in the last elections and the formation of a civilian government, the exit of Musharraf and the seeming neutrality of the army chief, General Pervez Kiyani, in recent political developments, might have given a temporary respite to the country's fledgling democracy. But, the challenge of exercising civilian supremacy over the military still remains a formidable task, and the prospect of the military taking centre stage again cannot be ruled out as the political parties struggle hard to continue their marriage of convenience. Even while a civilian government is in power, the army has since long established its supremacy in the political process and in foreign policymaking by its right to suspend an elected prime minister and keeping complete control over certain policy decisions like Kashmir, Afghanistan and nuclear weapons. Its intelligence unit, the ISI, continues to use Islamic terrorism as a foreign and defence policy tool and resists any kind of civilian oversight of its harmful and clandestine activities that have often boomeranged on Pakistan and wrecked its social, political and economic fabric. The Pakistani military enjoys all the benefits and privileges of power and takes no responsibility for the direction in which Pakistan is headed. At every stage in Pakistan, the military subverted the process of democracy and rule of law, even though the political parties and groups may have contributed their own share in paving the way for the military for having such a critical role through their sheer opportunism and short-sightedness, and in using the military to promote their own goals vis-a-vis other parties. The armed forces are major players in real estate, agribusiness and several other industries. The empire includes banks, cable TV companies, insurance agencies, sugar refineries, private security firms, schools, airlines, cargo services and textile factories. For instance, the Fauji Foundation is a "welfare trust" run by the defence ministry and spans 15 business enterprises. It provides jobs for retired officers, pays few taxes, and channels profits into a fund that is intended to benefit retired military personnel. And this is just one of the giant military-run foundations set up decades ago. In Bangladesh, while the local elections were held in August and the Awami League swept the polls, the outcome of the scheduled national elections in December this year is still quite uncertain. If at all the current experiment of social and political engineering by the Bangladeshi military succeeds, though doubtful, it can always take credit for cleaning the mess. The responsibility for the failure can always be passed on to the caretaker government whose civilian facade has been kept deliberately to confuse and hoodwink the domestic constituency and the international community. Such a 'rule without accountability' obviously has both long- and short-term implications for political developments in developing countries. The writer is visiting senior fellow, Centre for Policy Research, New Delhi.